What brings a customer back to a restaurant? While food might figure in most answers to this question, there’s an important factor that creates memorable experiences for diners – the ambience facilitated mostly by the decor. Decor plays a huge role in transforming first-time customers into patrons; a trendy looking restaurant will be more successful even if the food is just average. Evergreen Walls has shortlisted a few decor ideas that may just transform your restaurant into a trending hotspot. Most restaurants today use neutral colours to create a calming ambience. However, lighter pastel colours are starting to trend in restaurant interiors as well as exteriors. Pastels have a similar calming effect and help to enhance the dining experience. A regular feature in bars and clubs to attract customers, neon lights are now being integrated into the interiors at trendy restaurants to brighten up dark corners as well as highlight decor elements such as photos, awards or even an indoor wall garden. 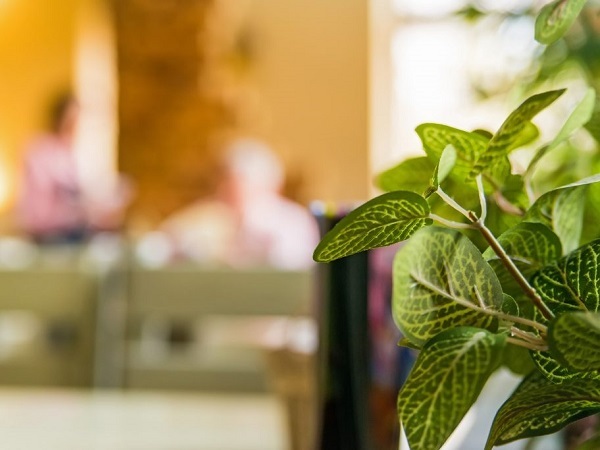 Greenery always works in restaurant decor but live plants may pose problems, especially to customers with allergies. Upkeep is another problem with a live garden – real plants need to be watered, exposed to natural light and taken care of properly. Instead, artificial greenery panels can be used throughout the restaurant to get the beautiful nature indoors. Artificial plants look so real customers won’t even realise the panels are artificial and will just assume they are well maintained live plants. Instead of designing your restaurant to fit the latest trends or going through the hassle of giving it a new look every season, try integrating different trends from the past till the present. This will not only create a unique ambience but also give customers an opportunity to reminisce about the past and see how the trends have changed over the years. Evergreen Walls offers a beautiful range of artificial greenery panels to help your restaurant keep up with the decor trends. Thinking of a complete design overhaul of your restaurant? Try an artificial green wall instead.